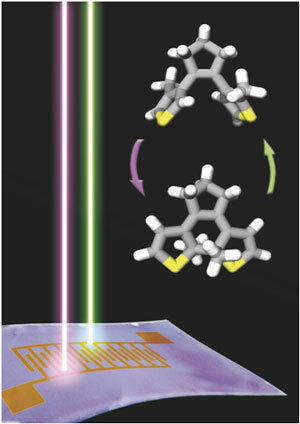 (Nanowerk News) Researchers from the University of Strasbourg & CNRS (France), in collaboration with the Humboldt University of Berlin (Germany) and the University of Nova Gorica (Slovenia), have shown that a carefully chosen blend of a small photoswitchable molecule and a semiconducting polymer can be used to fabricate high-performance memory devices that can be written and erased by light. Such multilevel (8-bit!) optical memories have also been implemented on flexible substrates, paving the way to applications in wearable electronics, E-papers, and smart devices. These results have been published in Nature Nanotechnology ("Flexible non-volatile optical memory thin-film transistor device with over 256 distinct levels based on an organic bicomponent blend").